On six-match series, South Africa managed to keep the series alive by winning fourth ODI against Kohli’s boys, though India still lead with 3-1 but missed to create history. Match held at New Wanderers Stadium, Johannesburg where spectators got over the edge of their seats while witnessing such a close contesting for the win . Huge expectation hyped up when Ab de Villiers announced to play in this pink ODI and every one among the host country sought for fortune goddess to bestow. Proteas wore their pink jersey on the sixth occasion intend to create awareness for Breast cancer with their #PinkDrive collected more than 2 million rands included the donation from sponsors such as Bidvest on every boundary R1000; Team sponsors on every catch R10,000 and sixes onto momentum family area. All these collected money was donated for the Breast Cancer Clinic at the Charlotte Maxeke Johannesburg Academic Hospital for the treatment of cancer patients. India on winning the toss elected to bat first scored a decent score of 289/7 where left-hand opener Shikhar Dhawan hit his 13th ODI century becoming the 34th player to play 100 ODI along with skipper who scored a half-century with the partnership of 158 runs. Once again severe local weather of Johannesburg with rainfall halted the match when Indian bowlers dominated the game. Because of rain D/L rule incorporated and host team presented with the target of 202 in 28 overs. All the factors seemed to favor Proteas team despite their top four batsmen returned to pavilion merely 102 runs on the board in 17th over, when David Miller returned back to the field after being dismissed by Yuzvendra Chahal on a No ball bowled by the latter. Until Miller dismissal, he scored 39 runs off 28 balls with two massive sixes which contributed a lot for the host team to chase the score. Heinrich Klaasen meanwhile continued to put Indian bowlers under pressure by hitting five boundaries and on another side, Andile Phehlukwayo entertained everyone in the stadium by setting the game on their bag by hitting three huge sixes as South Africa won the 4th ODI. Ab de Villiers who always scored a ton in pink jersey failed to show any remarkable stances by getting out when SA needed 100 runs out of 67 balls. 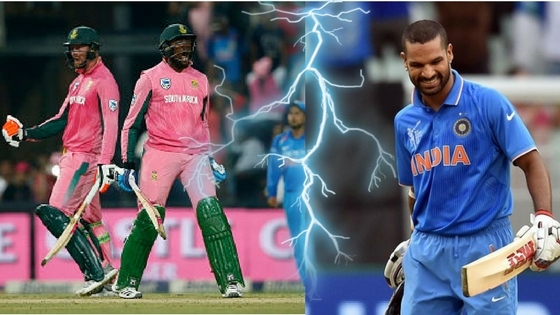 Pink team playing without any spinners faced some tough time in stopping Kohli and Dhawan strike on their fast bowlers. India at one point in the game seemed to cross 300 mark runs but after the dismissal of two in-form batsmen, India lost its momentum when Ajinkya Rahane got out scoring 8 runs putting India at 210/4. Again India’s reliable batsman former skipper MS Dhoni set decent score of 289/7 by scoring 42 runs not out. As 5th ODI is set to be played at St George’s Park, Port Elizabeth again Men in blue have the opportunity to write history, now all eyes will be set on the tight contest between Blue and Green.